It begins! We’re building our first ever Mara 1” 2 track machine. Stay tuned. Interesting. I remember seeing a Levinson modified Studer at the home of the late Dr Tardiff here in Miami. I remember Mark (Levinson) had a 1" four track Studer A80 modified near the end of his tenure (done as he did his 1/4" ML5 A80s). Wish I had that baby. ML made a few "one off" machines and recording electronics. The LNP-2 could be ordered with extras including internal mic preamps and a separate mic system including B&K capsules. I worked on a 4 channel mixer and had some prototype recording gear. Wonderful. I had the LNP2 with mic preamps and the B&K mics. As far as I know, Tim de Paravicin built the first two track, 1-inch machine. That machine was used by Kavi Alexander on his Water Lilly recordings (as was Ampex MR70 earlier iirc) and Sheryl Crow on her first album. The WL results speak for themselves. Music for the Motherless Child, though sadly never released on LP, was the most analog sounding disc ever. Having seen Wu Mann live, Kavi REALLY captured the sound of her pipa. I really wanted a tape copy of that recording but Kavi no longer had the machine in his possession. I don’t know do any other 2-track, 1-inch machines though could be some one off decks out there. Think about cost. 30 ips, 1-inch tape!?!? 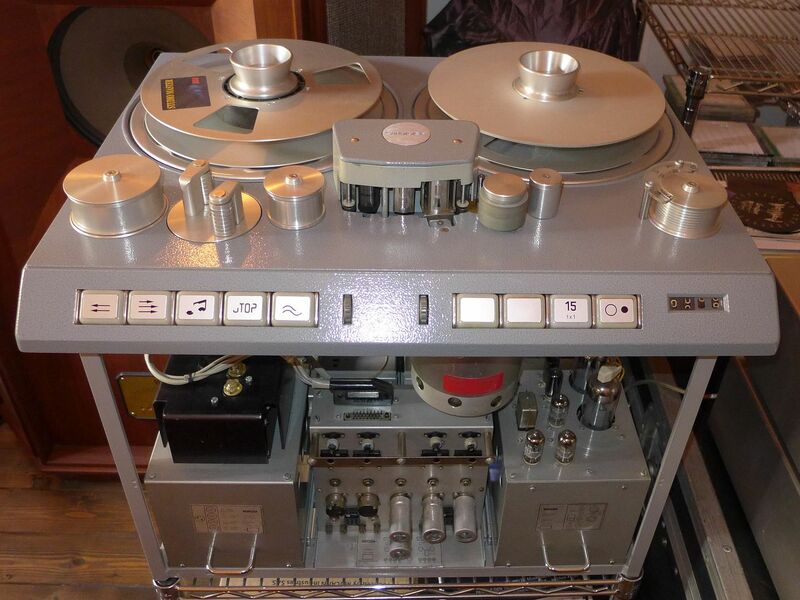 Cesare Ricci, the founder and onwer of Fone Records has a modified 2 track, 1-inch Studer C37. I know that Fabio Liberatore was involved in the modification of this tape deck. Bill Peugh/Metaphacts: What model was the Levinson/Studer Peter used way back when? Bill will remember it was a 1/4" two track Levinson Studer A80 ML5. Most recordings Peter did were at 30ips on that machine. We both had the same set up back then. Peter recorded classical and I mainly did jazz on my rig. I know some Mastering houses do have Ampex modified machines running 1" tape for many years now. For domestic use, it's not practical in any sense of the word. Sketsoteric Audio: "Analog Sound, Digital Flexibility"
One inch tape yes. But one inch, two track? ATR Services has been producing one inch 2 track machines for years. Most of them have been used for mixing or mastering. A few places that I can think of off the top of my head. Chuck Ainley, one of the top mix engineers in Nashville, Mike Romanowski at Coast Recorders in Oakland for mastering, Paul Stubblebine for mastering and I'm pretty sure he still uses one at the head end of their duplication system at the Tape Project. Also Jack White at his home studio mix down. Do you see the continuation of 1" tape production in the future? I suppose if there's 2" tape production...there'll be 1" tape stock available? Tape Project uses a 1" 2 track ATR100 for their running masters, I believe at 15ips. Paul Stubblebine starts with the original master tapes and makes the 1" 2 track tape from the original masters and that is used for the duplication of the tape project 1/4" and (by special order) 1/2" tapes. You can read about their process on the Tape Project website in the "Why Tape" tab. 1" 2 track - a long way to go for 3dB noise improvement plus Az instability hit. What's the next 3dB improvement? 2" 2track. This progression can otherwise be known as "Ray Dolby's Motive". That depends on how you define "perfect", though. It gets pretty tricky. Since the entire recording and reproduction of sound is far from perfect, indeed, amounting to only an acceptable "fake", then all we really can do to evaluate recording media is to compare the reproduced signal to the original input. And then we have to decide at what point something is "perfect", and what method we use to make that determination. If we say "audibly indistinguishable from the input signal", even that's tricky because we have to deal with the method and means of comparison. If we stick with a scientific method of controlled testing, many digital media types can hit "perfect". Analog tape cannot, never has, never will. But evaluating a medium for perfection is also asking the wrong question. The more pertinent question is "which medium provides the most enjoyable result?" And that's complicated too, but in the end, all that matters. We don't necessarily want "perfect" by the above definition, and since the whole experience is an illusion, adding another layer of imperfect mask to the original is a valid means to approach Audio Nirana on an individual listener basis. And a strong part of the experience is non-audible, physical, visual, and expectation. That makes "perfection", as a metric of user happiness, entirely subjective, and possibly at odds with the evaluation of media's perfection based on audibility alone. I am not aware of anyone having done this test, but I strongly suspect the high end listener population may show a statistical preference for something other than the live, unrecorded stereo bus output of a mixing desk, possibly choosing tape over it. Preferring Memorex over Live. So then, what is perfect? To the best of my knowledge Tim de Paravicini started making the one inch two track machines based on the Studer C-37 or J-37 machines. He had made several of them, including one for Kavi Alexander, one for Chris Rice in Connecticut, and a couple scattered across Europe. Eventually he made another for Dan Schwartz--that's the one used on the first Sheryl Crow album. Dan was the bass player in the band at the time, as well as writing for The Absolute Sound. Tim was using a head manufacturer in the UK at first. When they got out of the business he started having the heads made by Flux Magnetics. Tim told me that the Studer tube electronics were pretty good and he used them with only fairly minor modifications. My first experience with the format was when I was doing a lot of mastering for Kavi. He would bring his machine up from Santa Barbara for the sessions. I liked the format so well I decided to get one myself. At this point Mike Spitz was starting to make one inch two track versions of the ATR-100, and Tim was making record and repro electronics for the ATR-100's. That sounded like the right ticket to me. I got that combo in 1999, at the same time that Bob Ludwig was getting his. I believe Ludwig's is play only, I got the record/repro version. ATR Service, Mike Spitz's company, made several machines, some with the stock Ampex audio electronics and some with the Aria electronics that they were offering at the time. The other ATR specialist, Precision Motorworks, also made some. I know of several machines that were made with Studer A-80 transports, at least one in Tokyo and one in Texas. I don't know what audio electronics were used. I'm pretty sure John French has done some of these. Here at the Tape Project we make our one inch running masters on the ATR/deParavicini machine. They are played back in the duping room on a Studer A-80 transport with Ampex MR70 electronics. The MR70 electronics have been modified by Tim, and the head is from Flux magnetics. In the first couple of years we were using the MR70 electronics with a one inch version of the Ampex MM1200 transport, but that beast was retired long ago. The modification and integration of these machines has been done by our in-house technical staff. Ampex themselves only ever made a single ATR-100 in a one inch version, and I think this was after they had officially withdrawn from the analog tape machine market. This was not a two-track, it was a very specialized machine they put together for making audio alignment tapes for a one inch video format called Type C. I have it now, and it has been converted to two track operation for audio, as it deserves to be. So now Mara is making one. Anybody else? I have a Studer A-820 MCH one inch that's currently an 8-track, maybe that would be a good candidate. Bernie Grundman's tech associate, Bischof, did all his tape recorders using the A-80 transport, they installed those in custom made cabinets with Bischof own electronics as everything esle in Bernie's place. I took some photos when visiting them back in the early 2000's. At CopyTech Mastering in Puerto Rico, I used an stock A-80 but using the Manley Tape Head Amp. It was something else and I liked it a lot. Those were the days when both rooms where booked all week! Yes, there is still a pretty fair amount of 1" tape being used today. Many of the smaller digital studios snapped many of the 1" machines a few years ago when were being going out the door for cheap. These are either 8 track or 16 track machines that most studios use to record drums and bass, then bounce it over to protools. The same is true for 2" tape as well. I don't see nearly as many large 2" projects over the last couple of years as we use to see, just a few short years ago. Just three or four years ago I was still seeing several projects for 2" tape that would exceed 20 reels for tracking. Some of them were going out to as many as 60 or 70 reels for a single project. Last year I think we only three or four projects that used 20 reel or more. So far this year only one. However I still get regular orders every week for 2" for between four to 10 reels. Up until the first quarter of 2017, 2" was the largest dollar volume product that I sold. Than beginning in 2017 1/4" tape took over as the largest dollar volume product I sell. This was due primarily to the upward trend of 1/4" pre-recorded tape and small digital studios buying 1/4" machines to use for their final mix. I can only speak about the sales of the RTM tape. I don't know what trend ATR is seeing in their business, but from the number of different 1/4" related products they are offering today, I would suspect that they have seen the same trend. Don, in Puerto Rico not even the 1/2" tape is going strong. That's why I've been busy getting Otari MTR's and even some Studers for peanuts lately! Hell, I've even bought Nakamichi Dragon decks for $80.00. My last acquisition was this last Thursday when I traveled to the West Coast with my driver in one of my trucks to pick up a nice MTR 12 1/2" and Otari MX 5050 with a ton of sealed spare parts for just $1,000! Both were not working and un-used for over 10 years, but who cares? The MX 5050 is already singing like a darling and it took me 2 hours to fix it. The MTR has a PS issue, but I have many spares,so, It's just a matter of sit down and deal with it!